Home » You Can Help » Volunteers are saving our wild back yard! Volunteers are the heart, hands and backbone of Friends of Scotchman Peaks Wilderness. Without volunteers, FSPW wouldn’t have a board of directors, Winter Tracks instructors, or outreach folks in booths at fairs, film festivals and other public events. Volunteer hike leaders have the pleasure of taking folks into an incredible landscape of high rocky peaks and lush, shady rainforest paths. And bringing them back! Our volunteer trail crew helps keep the Peaks accessible for hunters and fishermen, backpackers, day hikers, and stock users. There’s nothing like the satisfaction of crossing back over a trail you helped build, clear or repair at the end of the day. FSPW Trail Ambassadors get to hike Scotchman Peak Trail #65, and have the satisfying and interesting job of teaching other trail users about wildlife encounters, leave-no-trace principles and the mission of FSPW. 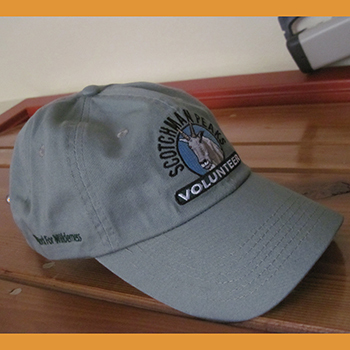 Volunteers earn a coveted FSPW volunteer hat and other perks. The Friends have many appreciation events. FSPW also offers crosscut saw certification, trail construction and maintenance training and wilderness first aid. Volunteers will have far-reaching effects in saving this incredible rugged landscape. They also have the pleasure of being advocates and stewards for our wild back yard: the Scotchman Peaks. FSPW volunteers make a difference in our world! Write to info@scotchmanpeaks.org to help!